Hundreds of projects built on new domain names. 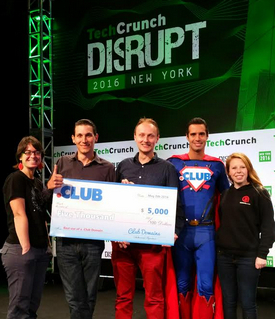 Homecookers.club accepts its prize at the TechCrunch Disrupt NY Hackathon. .Club and several domains from Radix got great exposure at the TechCrunch Disrupt NY Hackathon this past weekend. As the two top level domain companies have done previously, they offered domain names to the participants on which to build their new sites. The winner of the hackathon was AlexaSite, which uses voice control to build websites. Their example site make using the system was Jacksonfillman.Club. .Club offered its own $5,000 prize for the best use of a .club domain name. It chose Homecookers.club. You can watch videos of the contestants’ projects here. You’ll notice a lot of sites built on new TLDs, such as .club, .space, .website and .tech.